I think these two ingredients go very well together and it’s so easy and quick to make too. Add in the mushrooms and cook for 5 mins. Take off heat. Add in the prawns, place lid on pan and cook (without heat) in steam of curry for about 2 mins or longer as preferred. 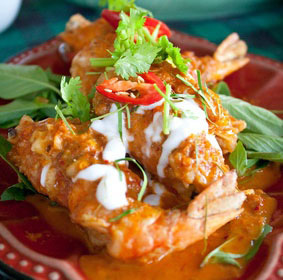 If using fresh prawns then cook for slightly longer. Do not over cook the prawns otherwise they taste too hard.